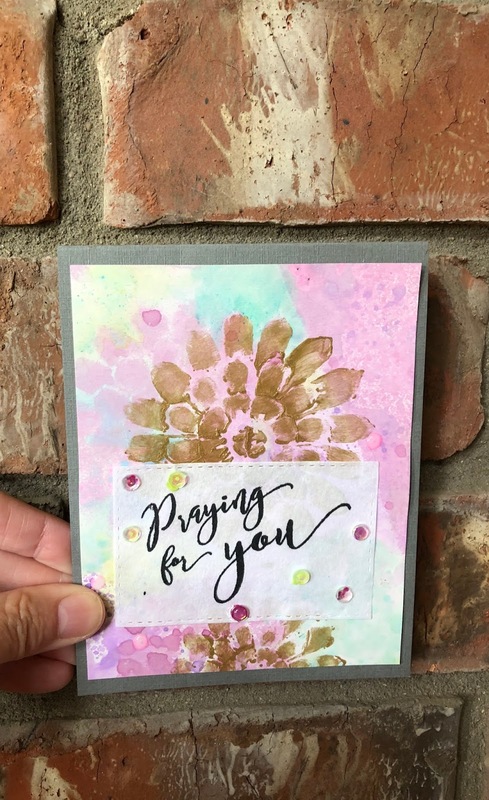 I wanted to give a shout out to the humble sympathy card. It doesn't have all the bells, whistles, sequins, and shimmer of any other card, but it is a very kind card to make. Like many of you, I've lost important people in my life and have received a sympathy card in the mail. It's quite surprising how much a kind word during a hard time can mean. I'm pretty opinionated about sympathy cards. Please listen to my advice and then go do as you please. 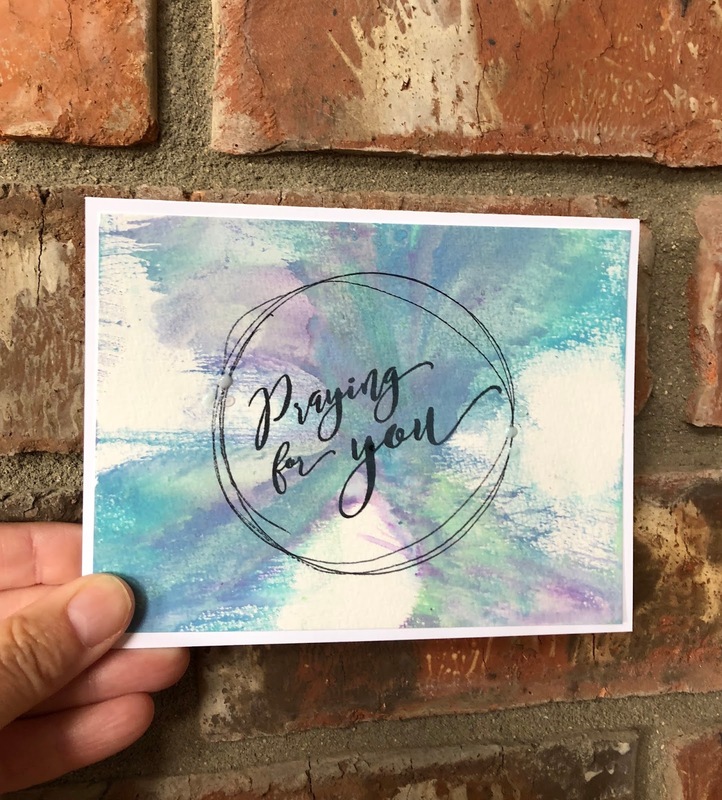 All of my cards were stamped with my Blessings Stamp set. They were designed for such moments. I believe a sympathy card should be rather simple. After all it's not about the card maker, is it? I love mono prints, and I have scads of them--really too much. But I turn to subtle patterns for a sympathy card. I cut them all into an A-2 size. My favorite stamp in my Blessings Stamp Set is the one that says "May the Lord bless you and keep you". It is a smidge of a very beautiful blessing in the Bible. I often hand wrote this blessing on sympathy, graduation, thinking of you, and other cards. It is the whole reason for this stamp set. I used this very stamp on my first card. I stamped in Memento Tuxedo Black ink with my Vintage Geranium stamped in Majestic Blue Versa Ink on the side. Tone on tone generally gives an understated look. I mounted the panel on some gray card stock I gleaned at the print shop. My second card is not exactly a mono print. 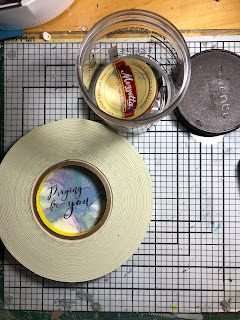 When I wanted to clean my Gelli Plate, I sprayed it with a good bit of water, and then sopped up the paint with some water color paper. It's great because my plate is clean and I have interesting paper. I stamped Praying for you and looked at the card panel. It was a bit modern looking, so I added some sketchy circles using the inside of my foam tape as a guide. Then I added Nuvo drops, but it wasn't necessary. I have a jar of lids, but used foam tape. The last mono print I chose was a pastel background that I had previously stenciled flowers in gold paint. It was bright enough so I only added my sentiment on rice paper and die cut it with a rectangle die set. 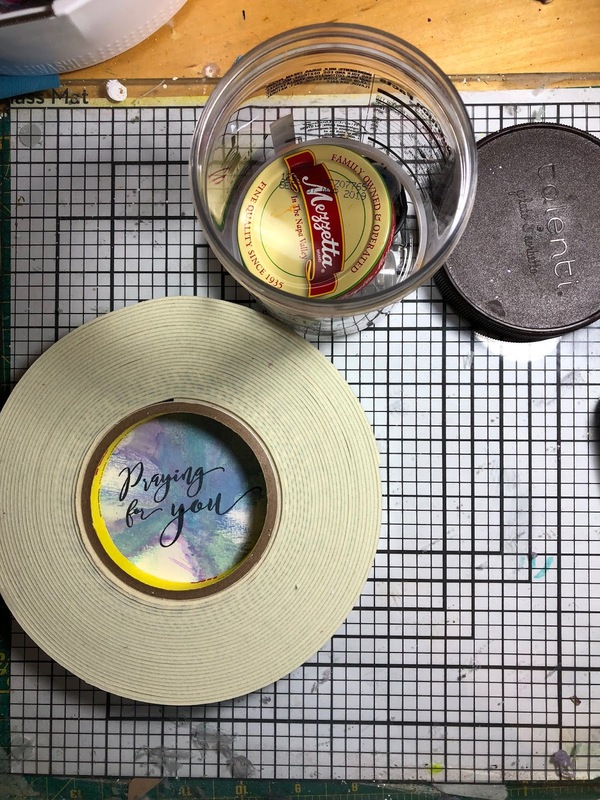 Rice paper is more opaque than vellum and let's you use adhesive on the back. Then I added a few Nuovo drops. The drops were too vivid, so I popped sequins on top. It was still too bright so I add clear Nuvo drops on top of the sequins--better. Gray paper toned everything down. 1. Share a memory of the deceased. 2. Acknowledge the horrible loss. 3. Add a few words of comfort: scripture, offers of aid, how much you value the recipient, and what ever lovely thing you think of. I do not recommend using the Praying for You stamp unless you are committed to do so. I hope you find this helpful and encourages you to offer sympathy to a friend or neighbor.